Pete’s passion for environmental stewardship led him to study at Sterling College, in Craftsbury, VT. 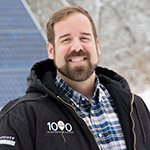 He began his career as a solar installer in 2008, then quickly moved into sales and consulting. Travel and adventure brought him and his wife out to Pacific Northwest for 5 years, where he continued to work in the solar industry. In 2014, Pete and Laura moved to Vermont to be closer with family, while starting their own. They have 2 little girls and live in Hinesburg, Vermont.